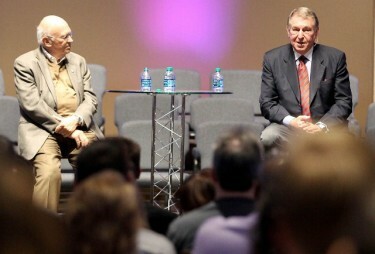 With a church altar as their sounding board, Dr. Ken Blanchard and Jerry Colangelo spoke from their hearts about Christian servant leadership Thursday to cap the spring speaker series for Grand Canyon University’s Ken Blanchard College of Business. The rows of packed pews at GCU’s neighbor First Southern Baptist Church echoed with “amens” and roaring laughter at times, as the business titans shared their feelings about how faith, family, business, money, and community service tie together. 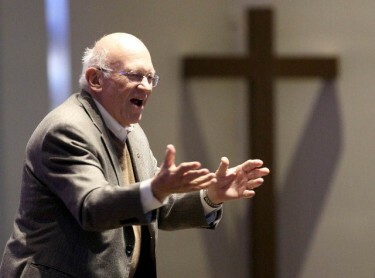 Dr. Ken Blanchard told Thursday's audience that business leadership positions are merely "on loan" from God. Honoring God through business dealings is key to spiritual growth, he said. After decades of business development and community service, both 73-year-olds encouraged their GCU brethren to remember that after this world, it’s impossible to take the wealth and accolades with you. Love for God and humanity are at the core of everything, including the pressures of the business world, they said. Business leaders who selfishly focus on image or profits ahead of making the best decisions for their employees, or their communities, are missing important opportunities to grow. “Generosity doesn’t just mean the accumulation of wealth and greatness,” Blanchard said — it requires giving of your “time and talent” to build relationships that help make real change in the world. GCU students Yvonne Cunningham and Angela Martinez attended Thursday’s evening event with other members of their capstone MBA class. The longtime friends, who’ve gone through the business program together, said they were less than one month away from graduating with their master’s degrees. Martinez said she felt like Blanchard’s servant leadership principles, including his seven guiding “pillars” for businesspeople to use in their daily routines, were introduced through her coursework in a way where she felt encouraged but not forced to accept them. “I think (GCU) teachers really try to emulate servant leadership,” Martinez said. Colangelo, the former Phoenix Suns and Arizona Diamondbacks owner, now serves as a special assistant to GCU President CEO Brian Mueller in the University’s transition to NCAA Division-I sports. Colangelo agreed to have his name linked to GCU’s new sports business program in 2011. Since then, he has surprised business classes by bringing NCAA president Mark Emmert into classes and helped attract former Suns star Dan Majerle to campus as the new head basketball coach. Both Colangelo and Blanchard said GCU’s rapid progress is being noted around the country and that they were constantly inspired by being on campus, around such a vibrant Christian spirit of growth and academic achievement. Blanchard and Colangelo talked Thursday about how they feel faith and business are intertwined. “God’s also blessed me with a platform, and that platform I’ve always taken very seriously – about what I can do, how I do it, what I think, how I represent the people associated with me,” Colangelo said. The best approach in life, Colangelo said, is to understand a personal framework of beliefs and “see the needs that are out there.” Then trust in God, and He will help lead you to the best opportunities to make the most significant impact on humanity — and that’s the most gratifying experience, businesswise or otherwise.